​Aries represents new beginnings. It is the first sign of the zodiac; a fire-dominant, masculine sign which means it is all about asserting our will; our ego's need to manifest our desires in the world - simply put, a need to be an individual. In the body, Mars represents marrow and everything encased in bone, i.e., the brain and nerves. Aries has the reputation of acting first and thinking about it later. Actually, 'Mars-type' individuals can do both very well simultaneously. ​The expression best used to describe this dynamic sign is, 'to think on your feet'. The transit of Uranus into Aries will certainly get us to do just that! So how does Uranus get on in Aries? Well, if Mars and Aries are all about the self and self expression, from that perspective Uranus is right at home. Uranus, like Aries, is impulsive by nature. Think about it, if you are forced to think on things too much, will you end up going with your initial impulse? Not always. Uranus promotes the self which can more easily be accessed through impulse. Let's face it, if we wish to see how someone really ticks, all we need to do is put them in some extreme situations and get them to act out of their natural impulses, without the time to evaluate. You may find some acting in unusual ways, relative to how they normally behave, because of this transit, but they are actually becoming more of who-they-really-are in relation to this area of their life. Uranus in Aries promotes individualization more than anything. New ideas, new ways of doing things, inventions of all kinds that promote the individual are on the agenda. That can be an empowering experience on the one hand, and yet, confusing for others on the other. Take, for example, the case of Britain wishing to leave the EU. Britain joined the EU when Uranus was at 29 degrees of Virgo, about to enter Libra. Now we have Uranus at 29 degrees of Pisces about to enter Aries, and in exact opposition to where it was on January 1 1973 when they joined. 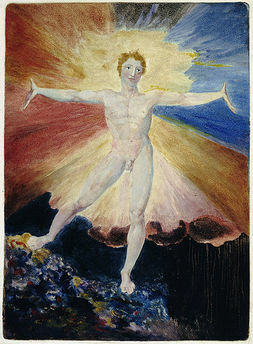 Pictured is William Blake's 'Albion Rose', which derives from the ancient and mythological name of Britain. ​This a new beginning for Britain, as they exert a need for freedom from the EU. Britain and the EU are beginning a long and messy divorce, as Uranus moves back to 29 degrees of Pisces by September 2016, not re-entering Aries until April 2017. We can look to those who are now in their late 30's and early 40's to see Uranus in opposition to their natal Uranus in sidereal Libra. For those born between October 1973 and October 1980 with Uranus in Libra, its opposition to itself by transit can create conflict. For those who are now around the ages 41 - 43, these years are a particularly relevant period. Any conflict is with yourself, even if it seems others are to blame. Yes, they may be involved in the life you have secured for yourself - just as Britain formed part of the EU and is one of its key architects. You have been involved in the making of what you now need to shake up. If, for whatever reason, you have not been true to yourself - your true nature - then this transit, in these years, will bring out some shocking feelings and subsequent upsets. ​The key thing to remember is that any upset will ultimately return balance and harmony. It may be an upset to the status quo, but you are finding out who you are. If you have been true to yourself, then you can be more of that in every aspect of your life, especially in the area of your life the sign Aries falls in your own horoscope. This area of our life is up for some major changes over the coming years. Some unexpected ones are part of the course. Stay open to find out who you are, not how family, friends, society and obligations have molded you. There is a strong need to express your individuality apart from these influences. There is, however, a complication for those born after October 1973, when Uranus moved into Libra. There is a strong need, on the one hand, to be true to yourself when Uranus transits Aries but, on the other hand, who-you-are is so entwined with others and what others think about you, that it creates conflict within your relationships. Aries is in complete contrast to Libra and you may begin to behave in ways which seem odd to those around you. We may see more and more people of this age acting out in the next few years. It may not be in the stereotypical 'mid-life crisis' fashion of buying a Porsche and dating the secretary! Many of this age may do some unusual things to try and 'find themselves' and it will take on many forms. As a man, trying to find yourself may seem like you need to be a boy again; to go back to the beginning, buy the toys and behave just like a boy. As a woman, it may play out by you leaving your familiar surroundings that you have nourished to find your role, only to find that it does not match up with the person you always wanted to be when you were a young girl. Oftentimes, people separate during this opposition, but it is possible that, because of the freedom so many are granted in many societies today, you will continue to explore yourself in the safety of familiar surroundings. The initial transit of Uranus into Aries is a bit of a preview, in may respects. That is because it returns to Pisces by September 1 2016, returning to Aries for its 7-year long transit in Aries by April 7 2017. So, use this period to test the waters (or fires, perhaps!) while Uranus sends shocks through the nervous system and gets us to wake up collectively, and buckle up individually. Ask yourself these questions. Are you living the life you want, or are you living for others? Are you being true to yourself, no matter how uncomfortable that makes others feel, or are you denying yourself so as not to rock the boat? Uranus in Aries favors the former. One thing to remember during this whole process of change, is that individuality, represented by Mars, is actually the ego, and is not really who you are on a deeper level. It is a construct. Uranus breaks through social constructs to find the 'you' beneath, but again, this is not who-you-really-are. There is something deeper still. Aries likes to blow things up like a hot-air balloon. A balloon that is too inflated can pop, of course. And the ego wants it that way. Boom or bust, everything or nothing, but give it a role it can strongly identify with. It cannot identify with the in-between, invisible space, which is not arrogant or martyred, but void of everything, completely silent. Keep an eye on Mars as Uranus transits through Aries for the duration, taking note of where it transits to create global conflict or personal power, depending. Globally, this transit is volatile. Personally, there is much you can do to make the most of it. Become familiar with yourself and the many selves you identify with, moving beyond this small self to reach a Higher Self and the assured sense of Self which this offers, and with which the ego simply cannot compete. For those of you who are now in your 80's, those born between April 1933 and May 1940, the transit of Uranus, returning to your natal Uranus, brings you around full circle. During these years, you are looking at your life gone and the life that awaits you beyond, which is a very different experience - a coming into one's own without the constraints of living on Earth, with systems and societies which have robed you of your true freedom. And make no mistake, no matter where in the world you live, you are pandering to someone else's needs to some degree. Uranus and Aries does not promote such pandering. Those of you in your 80's who are strongly self-expressive, are usually voraciously so, arguing with anyone who attempts to change who you are. You were born when Uranus was last in Aries, after all. Others may attempt to restrict you in some way, as is the case in many institutions for the elderly. However, there is one redeeming feature of old age - that of not giving a **** ! Now that's freedom. But this kind of freedom pales into insignificance in comparison to the true freedom which awaits after death. For those born with Uranus in Aries, a life lived from one's own perspective points you back to savor your individuality and unique life experience, while giving the rest of us pointers in how to move forward with this grounding-breaking transit.